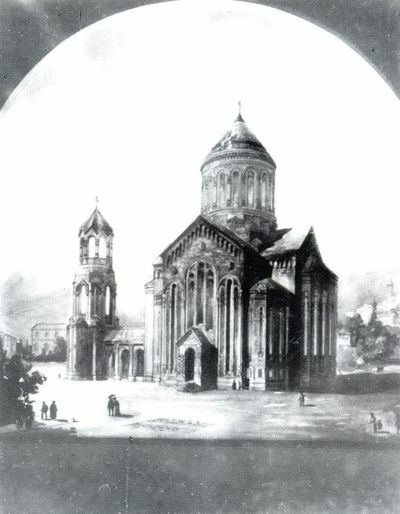 Saint Thaddeus and Bartholomew Cathedral (Armenian: Սուրբ Թադևոս-Բարդուղիմեոս Մայր Տաճար, Russian: Церковь Святого Фаддея и Варфоломея, Template:Lang-az), also known as the Budagovski Cathedral was an Armenian Apostolic church in Baku, Azerbaijan, built in 1910 and consecrated in 1911. It was located on the Bondarnaya-Dmitrova street (now known as Shamsi Badalbeyli street). Construction began on 2 August 1907 and was completed in 1910. The architect of the church was Hovhannes Kajaznuni. As part of the policy of destruction of religious buildings of the USSR government, the Cathedral was demolished in 1930, to be replaced with the building of the Baku Academy of Music. This page was last edited on 28 February 2019, at 08:42.